Lane-splitting and lane-sharing refers to the practice of passing slower moving or stopped traffic by riding a motorcycle in the gap between two parallel lanes of traffic heading in the same direction. In some cases, the term “filtering” has been used to specify moving between stationary traffic, while the terms “lane-splitting” and “lane-sharing” have been reserved for riding between traffic in motion. Regardless of name, reports specific to the general practice of motorcyclists riding between either stopped or moving traffic are referenced in this section. Research specific to this practice is limited. Additional information can be found in the Research – Crash Causes section, specifically reviewing the research regarding the position or placement of the motorcycle in the moments just prior to the crash. This report is the follow up to “Safety Implications of Lane-splitting Among California Motorcyclists Involved in Collisions.” The report summarizes the analysis of data from the California Enhanced Motorcycle Collision Data Project. The report is often referred to as the Berkeley lane-splitting report and is frequently referenced as evidence that lane-splitting is safe. The authors note the primary limitation of the study is the lack of exposure data. “To estimate how the risk of being involved in a collision changes when motorcyclists chose to lane-split, we would require information on both the lane-splitting and non-lane-splitting riding that is done by some identifiable sample of motorcyclists. The collection of these data is fraught with problems, and the current study did not attempt to collect such data. 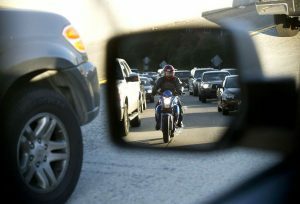 The current data set cannot be used to compare the collision risks for lane-splitting or non-lane-splitting riders.” The report also includes reference to the California Motorcycle Lane-Share Studies (surveys). This document summarizes an analysis of preliminary data from the California Enhanced Motorcycle Collision Data Project. This preliminary analysis found that Lane-splitting Motorcyclists (LSM) who were involved in traffic collisions and who were included in the Enhanced Motorcycle Collision Data Project had significantly different characteristics than other motorcyclists. LSM were better helmeted than other motorcyclists. LSM were less likely to suffer head injury, torso injury, and fatal injury than other motorcyclists. LSM were less likely to be rear-ended but more likely to have rear-ended another vehicle than other motorcyclists. This is the third survey initiated in 2012 and is designed to collect longitudinal information in a statewide statistically representative study of California motorcyclists and California drivers regarding their behavior and opinions on motorcycle lane-sharing on freeways and other multiple-lane roadways. Specifically, the anonymous survey collected data on opinions on motorcycle lane-sharing, its perceived legality and risks, and their personal driving perceptions and behaviors. This is the second wave of an intercept study initiated in 2012 and designed to collect information for a statewide statistically representative study of California drivers and California motorcyclists regarding their behavior and opinions on motorcycle lane-sharing on freeways and other multiple-lane roadways. The author of this report is James Ouellet, one of the original “Hurt Study” researchers. The study examines contemporary data collected by monitoring freeway video cameras and simultaneous speed data at the camera location. It also examines 1976-77 data from the “Hurt Study.” It compares the frequency of lane splitting motorcycles observed in moderate or heavy traffic to the frequency of motorcycles that crashed while splitting lanes. The report concludes that lane-splitting contributes little to the population of motorcycle accidents and eliminating a ban on lane splitting is unlikely to lead to an increase in motorcycle accidents. This is the initial survey conducted on behalf of The California Office of Traffic Safety. The objective of the survey was a statewide statistically representative of California drivers and California motorcyclists regarding their behavior and opinions on motorcycle lane sharing on freeways and other multiple lane roadways. Motorcycle safety has proven to be a difficult traffic safety issue to address. Nationally, motorcycle-use fatalities increased each year between 2000 and 2008 even though total traffic fatalities were consistently decreasing after the year 2002. In 2009 there was a sharp decrease in the number of fatal motorcycle crashes in the US, and it is estimated there will be a decrease in 2010. This report by the Oregon Department of Transportation examines the use of lane-sharing nationally and internationally and includes discussions on motorcycle and driver (auto) safety, and the potential benefits of lane-sharing. A review of literature relevant to lane-sharing revealed that research on the topic is limited. Benefits were often cited in motorcyclist advocacy publications and enthusiast articles. Quantitative data were limited and more generally related to capacity and emission benefits of motorcycles relative to cars. Relevant to the safety implications of lane-sharing, motorcycle crash causation studies provided the most direct information on lane-sharing. Studies, such as the 1981 Hurt report and the 2009 MAIDS report, considered lane-sharing as a causation factor.